01 Sep 2018 Jingle Bell, Jingle BAM! 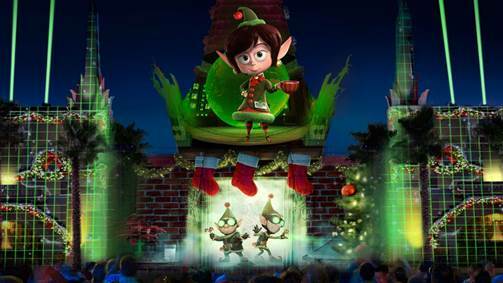 As part of this year’s Flurry of Fun at Disney’s Hollywood Studios® starting Nov. 6, 2018, the spectacular nighttime holiday fireworks show, Jingle Bell, Jingle BAM! is returning once again, and with it comes the popular Jingle Bell, Jingle BAM! Dessert Party! This festive experience begins as Guests step into the Chinese Theatre Courtyard to enjoy an array of holiday-themed snacks, decadent desserts, beer, wine, and specialty alcoholic and non-alcoholic beverages. While Guests are taking part in the festivities, kids of all ages can come and meet a VIP Disney character. Before the show, Guests will be escorted to a reserved viewing area where you’ll enjoy Disney Movie Magic – a beautiful projection show featuring favorite cinematic moments and the magic of Disney – followed by Jingle Bell, Jingle BAM!, a Santa-sized spectacular jam-packed with holiday music, fireworks, special effects, and dazzling state-of-the-art projections. A separate ticket for admission to Disney’s Hollywood Studios is required and is not included in the dessert party price.